How accurate is your investor data and shareowner records? Are you willing to bet on it? Many communication solutions are based on our initial data risk assessment and analysis, which sheds new light on the quality and accuracy of investor data. This service proactively identifies risk and cost issues and empowers organizations to mitigate that risk—protecting shareowners and the company. We provide a detailed account-by-account profile that reveals never-before available information about the hidden fraud, compliance, and cost risks inherent in almost every investor or customer data file. Having performed this analysis for hundreds of corporations and tens of millions of records, our understanding of data records is unrivalled—and our tools for correcting data errors are unmatched.  Many companies keep their customer or investor records in meticulous fashion and feel that they have everything under control, until they find themselves facing an unclaimed property audit. Keane’s data risk assessment process goes further and dives deeper using proprietary data sources and procedures. Our processes identify a greater number of decedents, discrepancies, and errors than you would be able to on your own, minimizing and mitigating your unclaimed property risk. This data rehabilitation process is becoming more important for the insurance industry, as state auditors and administrators have placed an increased level of scrutiny on their methodologies for identifying and verifying decedents, as well as locating beneficiaries that may exist. In several states, legislation has already been proposed that would mandate the use of the Social Security Administration Death Master File (DMF), or a comparable source. Life insurers would be required to compare their in-force life insurance policies and retained asset accounts against the DMF on a quarterly basis, as well as proactively locate heirs and beneficiaries and assist them with the claims process. Failure to comply with these requirements will likely result in costly audits and penalties, or even lawsuits. By partnering with Keane, you’re taking advantage of our proven risk assessment practices and procedures, and leveraging our vast unclaimed property experience. Completing an unclaimed property risk analysis is often the first step in the process of becoming fully compliant. We will help you improve the accuracy and integrity of your shareowner records and take them from good to great, ensuring full compliance in the long run.